Tracasseur: New Fear of Tigers! One of my absolute favourite producers of the past year has been Fear of Tigers. Mr Tigers is music journalist Ben Berry from Greenwich, London. Born in Kobe, Japan he grew up in the far east. After moving back to England in his teens, he moved to Tenerife, Spain to work as a DJ when he was 20. This period of time also resulted in a few house records he labels 'rubbish' (I don't believe it). Growing tired of DJing every night, he hasn't done it for five years now. 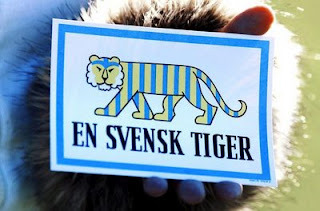 Ben also seems to have a soft spot for Sweden and Scandinavia; he is even learning swedish. So, does any of this reflect in his music? Well, it's obvious that he knows music. His productions have a wide range, from the slow electrotrashy funk of the remix of Mariah Carey's "I'll Be Lovin' U Long Time", to the lovely indie electro of the remix of Pnau's "With you forever", my favourite track of the last year, to his latest track, "Sirkka", an almost trancey synth house banger, and his most club-oriented track yet. Everything is really well produced and share a distinct sound though, with lots of great breaks and build-ups. It would be impossible to single out a favourite track, but I have to admit that I have soft spots for the Pnau, Anoraak and Does it Offend You, Yeah? remixes along with "The Adventures of Pippi Longstrump" and the brand new (got it yesterday night) "Sirkka". And who knows, perhaps a Scandinavian tour beckons? Ted & Francis, we like woah! Pegase to Stockholm next week!